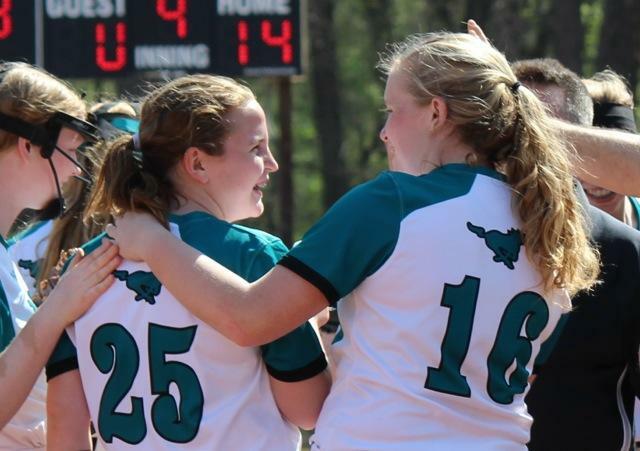 North Oldham Lady Mustangs Varsity defeated Hopkinsville 14-0 on Saturday as two pitchers combined to throw a shutout. Corinn Eads struck out T Joachem to finish off the game in her first high school pitching debut. North Oldham Lady Mustangs Varsity got things moving in the first inning. Madisyn Eads drove in three when she doubled. North Oldham Lady Mustangs Varsity tallied six runs in the third inning. North Oldham Lady Mustangs Varsity’s big inning was driven by singles by Chaney Floyd and Erin Hornback, a walk by Eads, and a double by Gabi McDonald. Madisyn Eads earned the win for North Oldham Lady Mustangs Varsity. She allowed three hits and zero runs over three innings, striking out six and walking zero. Eads threw one inning in relief out of the bullpen. Corinn Eads recorded the last three outs to earn the save for North Oldham Lady Mustangs Varsity. North Oldham Lady Mustangs Varsity racked up ten hits in the game. Madisyn Eads, Chaney Floyd, and Gabi McDonald all had two hits to lead North Oldham Lady Mustangs Varsity. North Oldham Lady Mustangs Varsity didn’t commit a single error in the field. Brooke Chick had eight chances in the field, the most on the team.